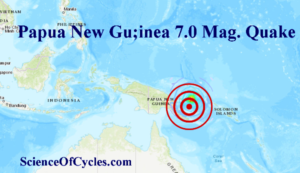 A magnitude 7.0 earthquake struck remote New Britain island in Papua New Guinea on Thursday, the United States Geological Survey said, though there were no immediate reports of damage. The quake hit about 200 km (125 miles) southwest of the town of Rabaul at a depth of almost 40 km, just before 7 a.m. local time (2100 GMT Wednesday). “We felt the earthquake a bit, but it was not too strong,” Constable Roy Michael told Reuters by phone from Rabaul police station. He said there was no damage in the town, but officers had not yet been able to contact villages closer to the epicenter.